The body can hold an insane amount of tension and most people have no sense of just how much. One challenge with doing a lot of movements (e.g., in tai chi) is that many practitioners get so preoccupied with the choreography that it can take an incredibly long time before they recognize the tension they’re holding—let alone do anything about it. Energy Gates qigong gets you to unambiguously—in a way that cannot be ignored—recognize layer by layer just how much tension you have inside you. Most of it, frankly speaking, is mind-blowing or freaky because you never have imagined what tension feels like at the level of your flesh and nerves. Mind you, I don’t mean as an idea in your head, but rather as a physically felt reality with tremendous specificity. 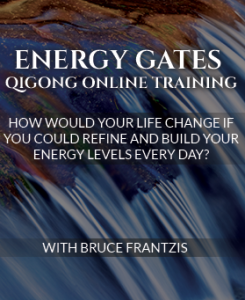 My experience with Energy Gates qigong woke me up to the tension I was holding in my body. I see a similar ah-ha experience happen for many of my dedicated students. Of course, this is really helpful to advancing your practice because you won’t want to live with it and let’s just say you’ll be properly motivated to get on the road to doing something about it. 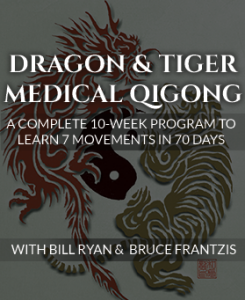 Of all the skills Energy Gates qigong is used for developing, one of the most important is how to coordinate and connect the different parts of your body until they work as one whole. One of the fundamentals of tai chi is moving your body as one integrated unit as supposed to a bunch of disjointed parts. However, I see students who’ve been practicing tai chi for as much as 10-15 years with parts of their body that are very disconnected from other parts of their body. Energy Gates qigong very directly hones your ability to internally connect your body. The primary purpose of standing, the first part of the Energy Gates Qigong set, is to start getting you to recognize the level of tension in your body. When you stand up, your two feet don’t move and sooner or later gravity will make you aware of any place where you’re holding tension. Gravity also makes it terribly obvious whether you are releasing the tension because there’s this thing called pain and discomfort and feeling weird! If you progress further, standing becomes a means for learning how to sink your chi (qi), because all you’re focusing on is what’s happening inside you. With tai chi and other more complex arts, it can become very difficult to focus internally with so much happening externally. Basically, by cutting down the number of variables in the equation, you can get to the central subject a lot faster. Conversely, adding 50 points of reference to the central point can make it a lot harder to fret out and understand the nature of any one aspect. Once you gain some faculty in sinking your chi, then you can once again deepen the internal content of your standing practice by dissolving. The Dissolving process, which I’ve written about extensively in my meditation books, is what actually releases bound chi. When you can stand and dissolve, your practice becomes somewhat magical—there are no two ways about it. Getting to the point where you can recognize the energy, energy flows and tension that resides inside your body can go a long way toward health and healing potentials. Most people do not and will not recognize when they block up their chi or simply dissipate it. So at this critical juncture, studying proper bio-mechanical body alignments becomes useful. Every form of sophisticated exercise from top level athletics, yoga, Pilates, dance routines and more, teach body alignments because of gravity—it has weight. If the gravity moving through your body causes parts of your body to smash in on each other, the result is like carrying a backpack full of bricks on your back. So, Energy Gates Qigong teaches these fundamentals in the same vein, but it goes beyond physical alignments and delves into the realm of teaching you how to feel your chi. Your body is composed of flesh and it also has chi running through it. As your body alignments start becoming clear, you will develop all sorts of sensations and feelings that you can begin to concretely recognize as chi. Another fundamental aspect of any good tai chi practice is knowing how to breathe well. You must learn how to breathe evenly and smoothly even when you’re moving around a lot. It’s very easy to get caught up in a movement sequence and forget about the breath, but when you’re standing still and focusing on your breath, it’s much easier to allow it to relax your body and recognize your energy. Then, you can use your breath to open up each part of your body. This in turn helps you become better aligned, which goes further to help you release any stuck places and sink your chi. It’s a positive feedback loop that fuses your body and chi into a coherent whole. A very valuable skill to develop. Cloud Hands encompasses all the principles inside tai chi, although the Energy Gates Qigong set is about 10 times older than tai chi. In the Cloud Hands movement sequence, you move your legs, waist and arms. You also shift your weight from side to side. Effectively, the same weight shifting is found in tai chi, including turning and your body weight going from one leg to the other. The only exception is that in tai chi you move back and forth instead of side-to-side. The point is, whether you’re practicing Cloud Hands or tai chi, you move while trying to keep your alignments together, chi sinking, tension releasing and breathing into your body. 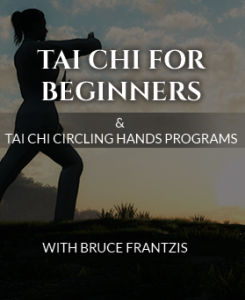 In Cloud Hands, you repeat one movement sequence, while in tai chi short, medium and long forms you perform 15-25, 25-50 and 50-100+ movements, respectively. Many people simply cannot maintain their focus on what is internally happening inside them let alone work out the kinks with so much choreography and the many neigong components that come into play. Practicing Cloud Hands helps you build the primary structural blocks that you will use and re-use continuously in tai chi. So, for example, rather than trying to figure out if your body is aligned in the midst of your form, you come to your tai chi practice already having the experience of feeling if your body is in alignment. The same principle applies to breathing, sinking your chi and all the other aspects of neigong. The Three Swings are practiced to fluidly connect your legs and arms together. You must release your arms and legs to a certain degree in order to adhere to one of the tenants of the Tai Chi Classics: The legs, waist and arms must move together. In other words, If there is a fault, look to the waist and legs. It doesn’t say look to your arms, chest or head! In tai chi, everything is generated from the legs and waist. The Three Swings open up all the blockages and physically coordinates your legs to your upper body. Each swing is progressively more difficult. Practicing the last two swings will hone your ability to turn, so that your weight shifts are fluid. This is how you separate full and empty within your legs—that is one leg having weight while the other is full of rising energy. Practicing all three swings also makes your waist dramatically looser than Cloud Hands alone, and will improve your Cloud Hands waist movement. The two together develop your ability to turn your legs and waist in tai chi, which become the driver of all arm movements. This principle lies behind every single tai chi movement. 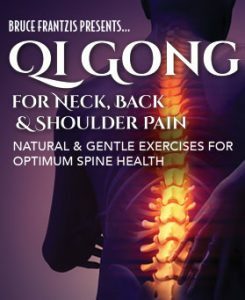 The final movement in Energy Gates Qigong, the unique Taoist spine stretch, first seeks to releases the spine. This allows you to connect the energy of your feet all the way out to your fingertips and head. The spine is very important because it integrates everything you do in Cloud Hands into your body at the end of your practice. 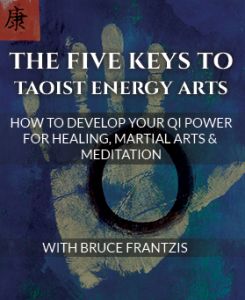 Whether your interest is tai chi, other internal arts, such as hsing-i or bagua, or just other qigong sets, Energy Gates Qigong will provide the means for developing the fundamental skills of all chi work. In time and with practice, you can develop your ability to recognize tension residing in your body, where your chi is blocked and not flowing and then effectively rid your body of that tension. Eventually, you can connect your body into one integrated unit, which sets the stage for the health benefits often associated with tai chi. To learn more about Energy Arts’ Opening the Energy Gates of Your Body Qigong training program, please click here. Howdy there, this is not for me but my brother. A few years back he had a liver transplant,and now is suffering kidney failure, so has dialysis treatments 3 times a week. Would it be ok if I taught him Energy Gates Qigong? Some he would have to do sitting until he builds up his strength again. I already have him doing Standing at the Stake which he can stand and for just over 5 minutes before he has to sit. Just curious what you thought about me teaching along with your course of course. Thanks John Parson, your student. We cannot specifically diagnose and treat at a distance. But we can say the Energy Gates Qigong has a great track record for reversing and ameliorating degenerative conditions. Feel free to share with your brother and follow the 70% rule. Standing, sinking, and dissolving, plus cloud hands should be the main focus, of course make sure his primary care physicians have no objections. Kind regards, Bruce and EA team. 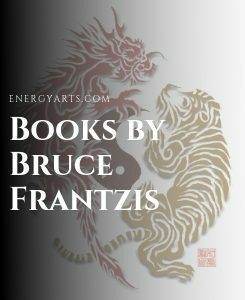 Hi Bruce and the EA team- would you recommend learning Dragon and Tiger first or Energy Gates first? I have some experience with the 8 Brocade and the Wang Ji Wu sets, currently I am healthy with no serious medical issues. Thanks!